Now, when you read the Bible you have to be careful not to read things that aren’t there. When we approach the Bible we bring all sorts of presuppositions with us and sometimes those presuppositions go too far and begin filling in things where they don’t belong. A classic example is Genesis chapter 3. When you read this text, what do you assume? Who’s the serpent? A great majority of people with whom I discuss this passage answer that the Serpent is the famous Biblical character, Satan. Few have ever even considered an alternative interpretation although the text is silent as to whom, specifically, this Serpent is or is meant to represent for the reader now and/or for the reader contemporary to the text’s composition. When you step back, does it even make sense that this character is representative of Satan? This text was written before Satan entered Jewish literature and theology. Satan is introduced after the exile when Israel was exposed to Persian Dualism. Before this, Satan, or any duality of good and evil, was not a part of Jewish theology (though the idea of chaos and order, good and evil, were popular in the ancient near eastern culture, it wasn’t a Jewish concept). In Genesis 3 we don’t see any dualism. In Ancient near eastern literature dualism was introduced using literary contrast. For example, religious groups and nations other than the Jews often used serpents and eagles to symbolize chaos and order. Here we have a serpent but no eagle, no contrasting character. In fact, the eagle is the only element missing from common near eastern symbolism for dualism. The tree would also have been common in dualist symbolism. There would be a tree in the midst of a garden either being guarded by or destroyed by a serpent (a symbol of chaos) while flying over head was a great bird, an eagle (a symbol of harmony and order). This illustration would have, no doubt, come to mind for the reader of Genesis 3 but they would have noticed something unique. In our text there’s no symbol for order and our usual symbol for chaos isn’t destroying the tree but, in fact, seems to be living among it or even within it (that’s the classic picture—the serpent dangling from the branches). The serpent isn’t guarding it either, in fact he’s offering fruit from it to his fellows in the garden. This suggests to me that we may be dealing with a theological response to and against the ancient dualism in the near east. Everything is good, even the serpent. Notice the language used to describe it. In verse 1 it’s described as the “smartest” (that’s my translation). In Hebrew this is the word ‘arúm which is often translated as “cunning,” “crafty” or “clever.” But these English words carry negative connotations which they didn’t use to. Cunning has come to imply manipulation, but the Hebrew word doesn’t carry any of these implications. ‘arúm may be best translated as smart, it’s a complement not a character flaw. Everything in God’s creation is good. No dualism, no Satan. So if our assumption is wrong and the serpent isn’t Satan, then who is it or what is it? We’re left with a huge question mark at this point. To find an answer we need to step, as best we can, into the mind of the ancient near eastern reader. What might a serpent symbolize? Where might we find this symbol? Well if we look to Canaanite religion we might find a good answer. Serpents were huge in Canaanite symbolism, they were a symbol of eternal life and they were found all over the place. 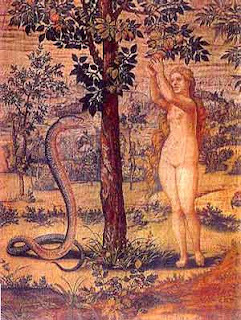 So let’s consider, at least for a moment, that the Serpent is the symbol of the Canaanites and that the Man (Adam) and the Woman (Eve) symbolize the Israelites, the People of God. This means that the Canaanites led the people astray and because of being enticed by the Canaanites they were kick out of the garden. And the Canaanites were cursed along with the Jews. From the perspective of a Jew in the ancient near east, who were the Canaanites? In Genesis 9 Canaan is cursed and from then on there is strife between his descendants and God’s people. Just read the book of Joshua. The Israelites take on the Canaanites as a conduit of God’s judgment. The Canaanites are a cursed nation. Now if Adam and Eve are the Israelites and the serpent is the Canaanites, then what or where is the Garden? Perhaps Eden, Paradise, is the symbol of the Promised Land, the land of Canaan. Now, remember what happened to the Israelites when they inhabited the land? They were led astray. They began embracing the customs and influences of their neighbors, perhaps the Canaanites, and it got them exiled from their land—kicked out of Eden, one might say. Therefore, Genesis 3 acts as a myth (not simply something that didn’t happen but a symbol of something that happened and happens and is happening). It’s not a propositional account of how sin entered the world, though it indeed functions in the narrative as just that. It’s a narrative of how God’s people are to interact with their neighboring nations, with different religion, different philosophy, and different narrative. This is a huge motif within scripture—being conformed to the ways of other nations leads to very bad things. Look at Exodus 32. The people of God decide to worship him the way an Egyptian would and God gets angry and wants to kill them for it (but Moses talks him out of it). Also look at the book of Samuel. The people want a king, just like their neighboring countries (they were afraid of the Philistine inland conquest and they thought that their way wasn’t good enough to fight them off) and they ended up getting Saul who did a very bad job filling the position and they eventually paid the price for this conformity. And finally, look to the New Testament. Paul calls us not to be conformed to the “patterns” of the world (Romans 12:2) and throughout the New Testament the reader is warned not to conform to Roman values but to proclaim that Jesus is Lord, not Caesar. Genesis 3 may be a warning about how we should deal with other philosophies and narratives. They're not bad guys, they are who they are, but we mustn’t forget who we are. If you remember the Serpent offered Eve something she and the man already had—eternal life--something that really only God could offer. In accepting the fruit they forgot who they were and thus they were banished from the garden and from living in harmony with creation. The eventual hope is not for the crushing of the serpent’s head, that’s part of the curse which Jesus came to bring an end to. The hope is for reconciliation. Man’s relationship with God and with his neighbors will one day be brought to reconciliation not retribution. As a myth, Genesis 3 is meant to be reinterpreted through the generations. The serpent is whoever or whatever may lead God’s people away from him and away from true humanity. And the hope is that we may live in harmony with the Serpent and learn how to be who we are in the midst of who they are. The hope is that in our conversation and interaction with our culture we may still keep our identity as the people of God in Jesus Christ.